It might only come out once, so savor it, people: Mr. Prepared was right. Alright, now that we have that out of the way, let’s get on with the backstory, right? I have been hemming and hawing about doing this race at Highline State Park near Grand Junction for about 3 weeks. I have been completely avoiding it- didn’t make any camping or hotel reservations, didn’t find someone to watch the dog, etc., etc. I knew that I was underprepared, certainly not where I imagined I would be when I signed up for the race in January. I tried to switch distances earlier this week, but it was too late. I tried to reason with Mr. Prepared that it was only a $35 New Year’s entry fee, so we could easily skip it without guilt. But he stood firm. He made a hotel reservation. He found someone to watch the dog. He changed out my tires, packed the car, gave me a pillow and told me to take a nap on the way. After my nap, I watched this video by the Cyber Crush, which helped me remember why showing up to this race was important. Since I was stuck going, I reasoned that I could take the race easy, make it a long intensity workout, and not sweat it. Which was a giant fat lie to myself. A lie I kept repeating to myself until we got there this morning. For those of you who don’t know me, I am pretty competitive. A lot of women feel the need to downplay their competitiveness, but I will be straight up honest and tell you I am. But if you look at it my way, competing against others on my own in a healthy outlet like triathlon is a hell of a lot better than taking my competitive nature and yelling my head off at my kid’s soccer game or driving super aggressively through the school parking lot. It is what it is, so when I come to a competition, I come to compete…not for some long intensity workout. But I knew that today I couldn’t rely on being really prepared or really rested, or anything like that…today was a COLD SHOWER THERAPY kind of day. It was time to find out if I could shut down my negative thinking while busting my guts out there. The lake was warmer than I thought it would be at this time of year, so while the air temp was cold, it was not the numbing freezingness of last October’s race here. Once we started, I fell into a decent rhythm by about 500 meters. I knew there was one women out of in front of me somewhere, but I wasn’t worried. I was really enjoying the swim by about 1000 meters, and I started thinking that maybe I should do another lap, or just get out and stop…end on a high note, you know? But of course I couldn’t stop myself…I could hardly keep myself upright as I ran to the transition, since I had completely forgotten my ear plugs (which proves they really do work!) and was super dizzy at the swim exit. T1 was a disaster, as I couldn’t stand and put on my shoes since I was shaking, and I wanted my light windbreaker, which I couldn’t get on, although it certainly didn’t help that the transition area lady was yelling at me that I should have put on more Bodyglide (like, thanks, your advice after the fact is sooo helpful!). Fortunately, they had adorable stools, and I sat and pulled it together. 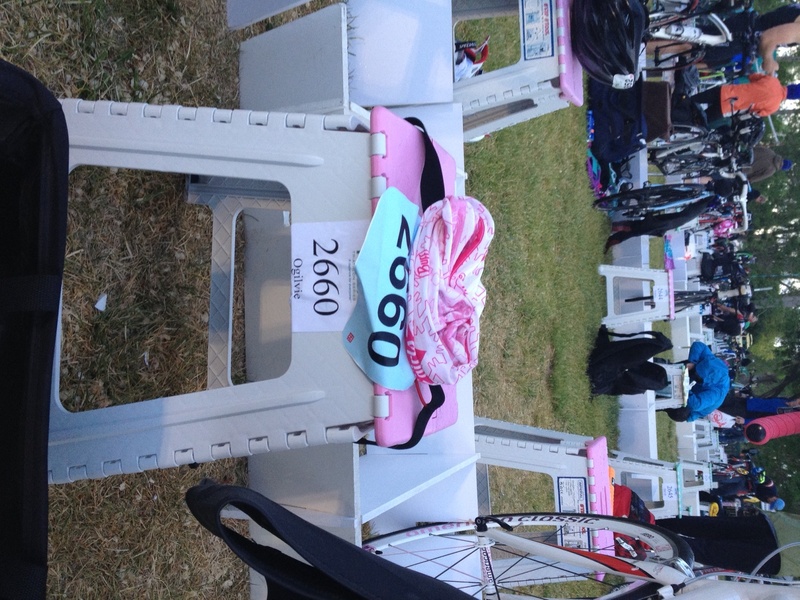 just to be clear, I snapped this before the race, although my time in transition 1 might imply otherwise. So then it was off on the bike. I felt pretty good for the first half. I am having a little love/hate relationship with my bike right now because sometimes it feels like it’s not “enough bike” for me. I know we need to do some tinkering, upgrading, etc., but we really haven’t gotten around to it. Plus, it’s kind of rush when you pass by the people with super fancy bikes and aero helmets on your Specialized Allez Sport stock bike and outlet-purchased helmet. Just sayin’. Getting to the turnaround was great, but I could tell I was starting to flag around Mile 20. There were a lot of positive and negative thoughts going on as a couple of ladies passed me at the end of the bike. I had to keep my mind from wandering down the spiral of, “What am I doing out here? I am just a mom with too much back fat hanging out.” I kept up the positive mantras, and when they didn’t shut the negative thoughts down, I just started singing Macklemore in my head. Totally worked. Until about Mile 4 of the run, anyways. I had been bargaining with my body that if it would just give me 2 good miles, I would stop for a pee break. Which it did, and I did. Then a bargain for 1 more mile to the turnaround. Then 1.5 more miles back to the final aid station. And that’s about when my body decided it had had enough. Another person pounded up the hill in front of me, and I started walking. Just to the top, where a volunteer was like, “You still got it! You’re one of the top ten ladies!” And that became my mantra, as I closed my eyes, prayed no cars would hit me, and ran another hard mile. I had to take a little break to walk up the hill before I got onto the dam (mostly because I wanted the finish at the end of the dam to look good, since everyone was watching there). I put my head down and chugged out the last .2 miles. My run time was a little ugly, but so was the course, which they admittedly changed the night before to a bit hillier course. BTW, big shout out to the HITS Triathlon Series! They made this event AWESOME! I hope this venue can be their new Colorado home.